Ted Seward, ResponsePoint’s Director of Marketing and Business Development, shares his thoughts on how marketing and sales lead generation has changed during his tenure in the industry. No big surprise— data is a critical part of marketing success. 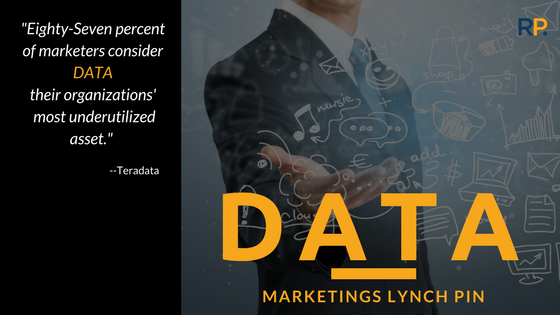 Data is the lynchpin of marketing success. It’s required for successful and measurable outbound efforts, and it’s generated from inbound efforts. How you run, analyze, and utilize data is critical to marketing, sales leads, and revenue. Marketing technology doesn’t exist without data. It is the Achilles’ heel of any organization. If you don’t measure you can’t improve, strategize, or produce reports of substance. So if data is now, what’s the future of marketing? The inherent flaw with data is that you must be able to use it. The lynchpin for all of this comes when the insights become more refined and exact—when creating target markets and segments is done predictively from the current insights and data. And, even if your data set is too small there are models that you can apply that mimic the data learning through AI. Marketing will become less subjective and more exact. Now only in its infancy, campaigns are starting to be tested via AI based on outcomes from previous efforts. Along with this predictive and artificial intelligence will be better attribution of the nano meta data gathered from the points of action between influence and engagement of a potential client. Think of it as the caller ID of the past, but relative to a multitude of buyer interactions that can be interpreted and predicted. Before any of these evolutions can occur, the oversaturation of martech tools needs to be culled down via consolidation. Marketers need to have fewer tools that do more, and do it more intuitively. Once AI fully enters the ring, it will be a whole new world. Using data effectively requires more than a cursory knowledge of Google Analytics. If you are going to invest the time and money into a solid data practice, you want to build the right team. That means working with qualified, strategic analysts, and marketing professionals who know what to do with the data results they are given to produce sales leads and revenues. It also requires your clients to be either data savvy or open to the process. It’s still a very shiny and unknown world for a lot of older companies, but the proof can be shown very easily in the numbers. Before you build a data component into your marketing program, be sure you’ve got the right players on your team.